We are running two VMware ESXi v4 systems. We access our VMs on a NAS via iSCSI. Recently, we had some issues and had to remove and reconfigure the iSCSI LUN on each server. On one, it came right up. We were able to see the LUN and it mounted just fine and we saw all of our VMs. On the second VMware ESXi box, if we do a Rescan.. it won't auto-mount the LUN (which has VMFS). 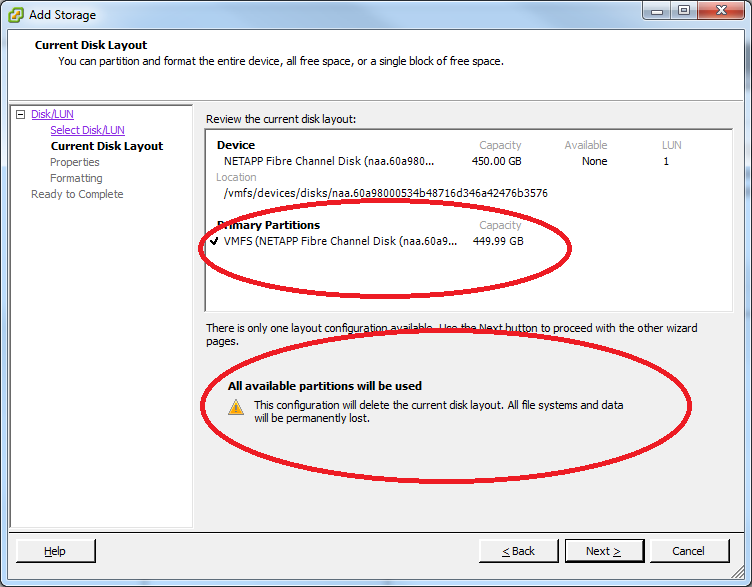 If we do an Add Storage, we can find the LUN but then we get only the option "Format the disk [create a new datastore]). BTW, we can mount a second LUN on both VMware servers just fine that we use for some other VMs that we just created. can you mount this LUN on the other ESX servers? no one has presented this to A Windows source and formatted it? could you explain what reconfuguration you did on the LUNs? 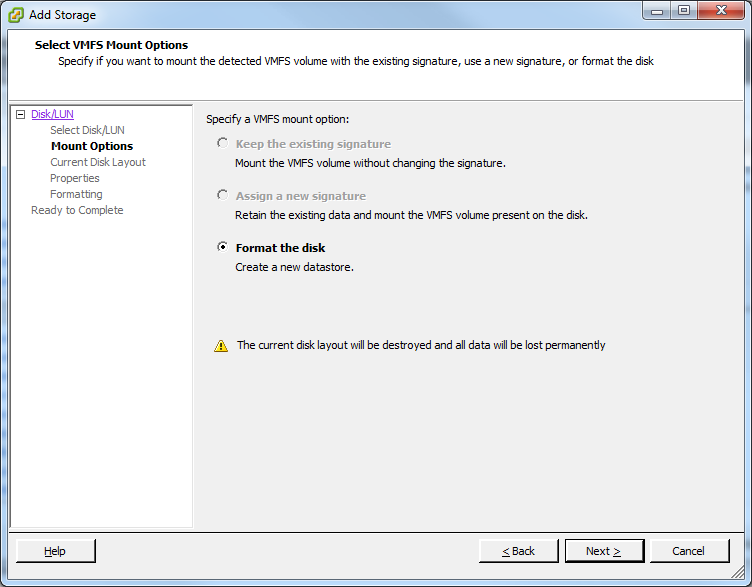 Is the option to re-signature available when you go through add storage wizard? if seems that for some reason the signature on the LUN has changed. Hence VMware ESXi, wants to reformat, rather than add. 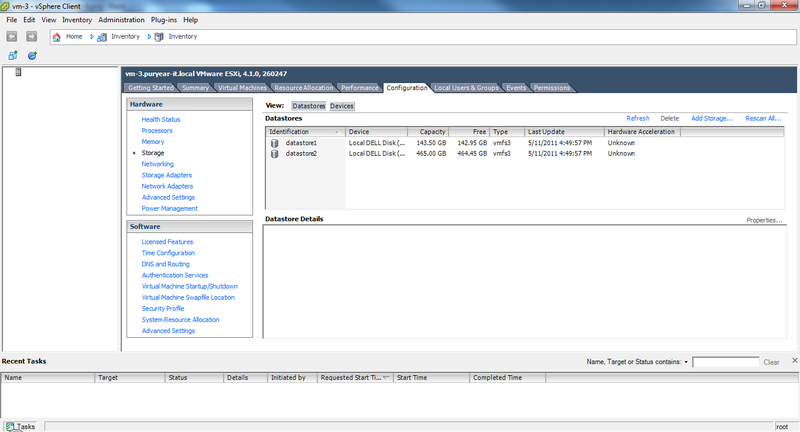 You can also re-signature existing VMFS volumes through the vSphere client using the "Add Storage" wizard in the host configuration tab storage section. 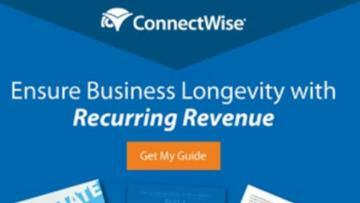 - Re-signature volume and keep data. - Keep existing signature and mount the volume. If this LUN is used on other ESXi servers, keep the signature. Let's clarify a few things just in case. The LUN is being exported by a NAS that offers iSCSI. vm-4 is able to mount the LUN just fine and sees the filesystem and VMs. vm-3 wants to format the LUN. also do you have valid backups of the vms on the lun. 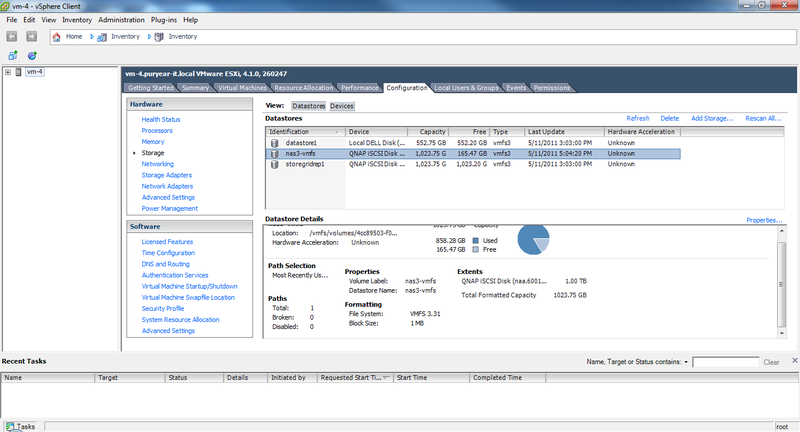 The volume is mounted on vm-4, but that's common practice with vmfs. Or perhaps I'm missing something. in the gui, do a rescan on all storage, then review the /var/log/vmkernel file for errors. 'less /var/log/vmkernel' will open it, do a capital G to go to the bottom of the file, then use the page-up/page-down keys to navigate. Look for any error messages, especially those that reference that naa id or UUID. post the file up if you can, too. You can download it with winscp or cp it over to a working datastore and then use the datastore browser to download it to your pc. and see if you get an error, this is the equivalent of the gui mount option. Sorry. Give me a little more time. Thanks. Very helpful and to the point. Took the time to read through my initial question and my responses and gave me the absolute right answer. We also use the command line, rather than the GUI, because it's more powerful, or I'm I just old fasioned, and not a GUI man! Glad it's resolved, and that issue is more common than you think! Yeah, I wrote an internal KB for this issue based on this EE thread. Thanks! My issue was slightly different, but for those that wander here and find the above solution doesn't work. Try a capital 'M'. It is a different command and resolved my issue. Same premise as the OP but nothing else worked. But I couldnt mount this, when i attempt to mount, it says that it is going to format all data.